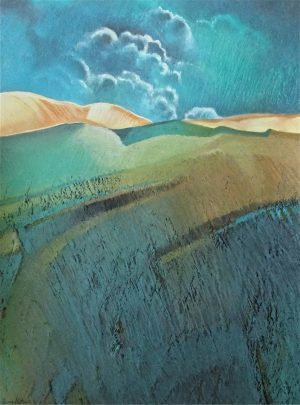 Whether displaying beautiful, sublime landscapes and river bends, or colorful abstracts, Jerry Gates uses color, contrast and the richness of ever changing textures to capture a multitude of compositional possibilities. 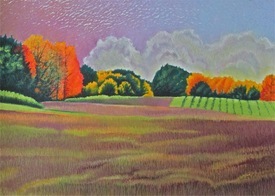 His work is a product of Jungian psychology and a familiarity with art, past and present, expressed with oil pastels. Gates grew up in Bay City, Mich., where he took art classes all four years of high school. He says he felt fortunate that art was not only offered, but also encouraged. 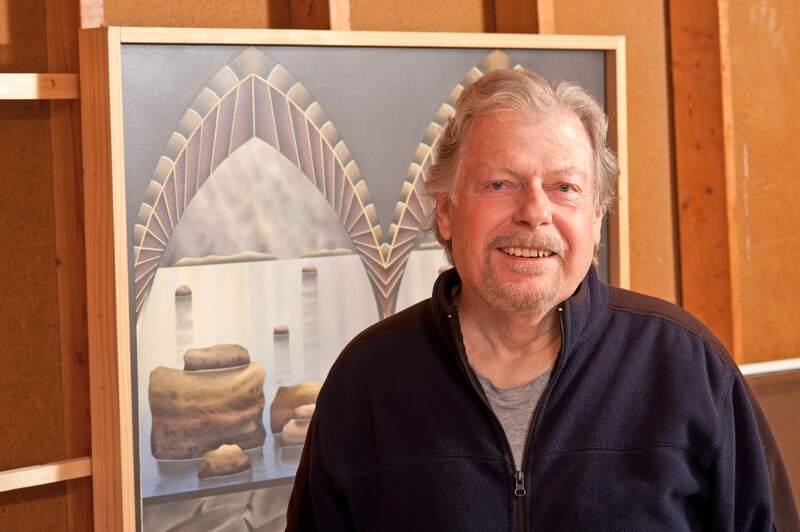 He taught art in Elk Rapids, Mich., and received an MFA from Central Michigan University, the first person to graduate from Central’s MFA program. 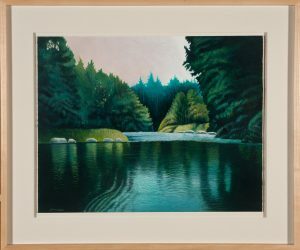 He then worked at Central as an assistant professor of art before returning to northern Michigan to work as a counselor — but he never stopped making art. 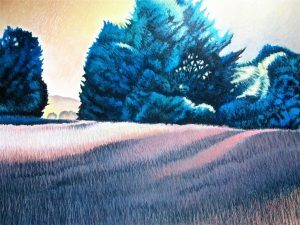 He also taught art at Northwestern Michigan College in Traverse City and, upon retirement in 2005, began working with his art full time. 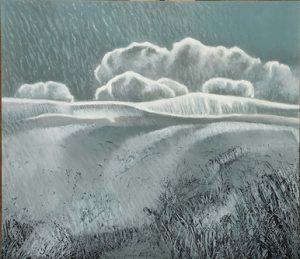 “Above the Gush” by Jerry Gates, oil-pastel, 37.5 inches wide by 31.5 inches high, framed, $2,700. 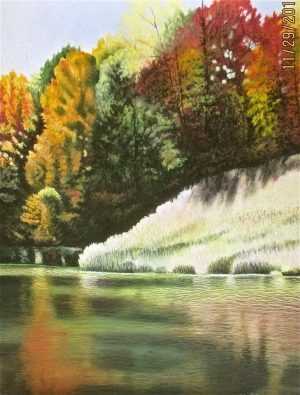 “Autumn Hillside on the River’s Close” is an oil-pastel on paper. 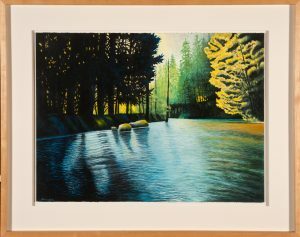 Contemplative, but ready to cast a fly in “Dark Cedar Bend” by Jerry Gates, oil-pastel, 37.5 inches wide by 31.5 inches high, $2,700, framed. 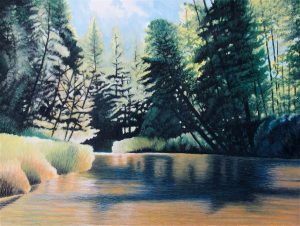 Jerry Gates’ Dark River Shadows puts you right in the canoe or kayak, floating down a scenic Michigan River. 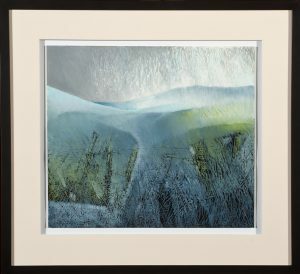 “Geologic Landfall VIII” by Jerry Gates, mixed media, 23 inches wide by 21 inches high, $500, framed. 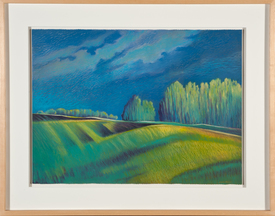 “Green Grove” by Jerry Gates, oil-pastel, 39 inches wide by 31.5 inches high, $2,700, framed. 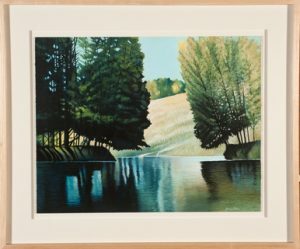 An homage to fly fishing is “High Banked Glide” by Jerry Gates. 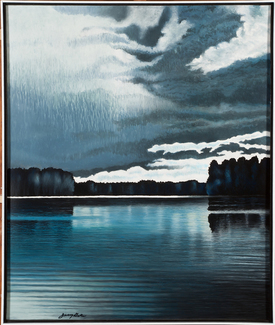 Calm, but mysterious is “Island Lake” by Jerry Gates, oil pastel, 31 inches wide by 37 inches high, $2700. Autumn is the season of the grape in northern Michigan — although the vineyards are gorgeous all year long.